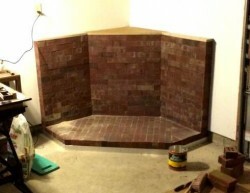 Well I really am working on getting ready for Christmas this weekend, but wanted to post an updated photo as the dry-stack brick project in the poolhouse/ garage. As mentioned previously, the floor leveling was the biggest pain in order to level the top of the “walls.” I used an aluminum angle to hold a sand base before placing and cutting the bricks that line the floor. The 3 rear walls are tied to the wall with anchors and eventually the mantle/top will get wrapped with some extra airplane 6061 aluminum — kind of a waste? With the warm weather we’ve been having I’m not overly excited about finishing up just yet … but at least the insulated chimney is in and I’m almost ready to place the woodstove on the bricks.